The world’s most exciting BMX Supercross riders have warmed up for next month’s World Cup in Manchester in style after taking part in a thrilling British Open. 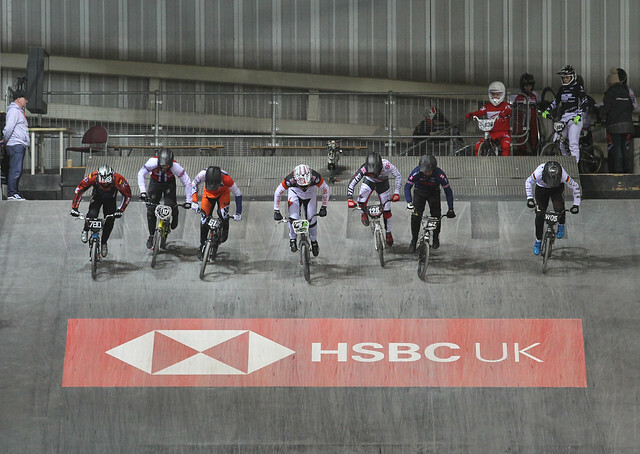 The UCI BMX Supercross World Cup series is returning to Manchester’s HSBC UK | National Cycling Centre from 27-28 April 2019, when the world’s best BMX riders will battle for the world cup title and qualifying points ahead of the Tokyo 2020 Olympic Games. And this weekend saw top talent gearing up for the big occasion, with men’s and women’s elite and junior competitions taking place. Laura Smulders reigned supreme in the women’s elite event, adding to a superb 2018 which saw her dominate the supercross series. The Dutch star rarely dropped out of the top three, racking up five wins in eight stages, as well as adding the rainbow stripes to her collection at the Baku 2018 World Championships. Displaying all her class in Manchester, Smulders took the holeshot in the winning move, leading smoothly from the front, with Dutch teammate Judy Baauw tucking into her wheel. Smulders opened up a gap and cruised home with Baauw, fending off Denmark’s Simone Christensen, while Britain’s Bethany Shriever came home fifth. Dutch success continued into the men’s event as Niek Kimmann – who suffered a crash in one of his earlier rounds – picked himself up and was unstoppable in the final. Taking the holeshot, he left the riders battle it out behind him as he stormed to the win. David Graf took second spot in the opening straight but Twan van Gendt made short work of the first bend undertaking the Swiss rider, leaving him battling for third spot, whilst Van Gendt hung on to second. British riders Quillan Isidore and Kyle Evans brought home sixth and seventh in the hard-fought final. The home riders enjoyed plenty of success in the junior categories, with Ross Cullen making the most of taking the holeshot to lead out a commanding one-two, with teammate Ryan Martin in second place. Dutch rider Bart van Bemmelen rounded off the top three. In the junior women’s class there was another stronger performance from a British rider, with Imogen Hill, racing hard to take a worthy second behind French winner Tessa Martinez. America’s, McKenzie Gayheart took third with Brit Eleana Stafford powering to a strong fourth. The Supercross World Cup action kicks off with Manchester hosting the first two rounds late next month, with the world’s fastest and fearless riders tackling the bigger jumps in what is set to be an exhilarating and breath-taking weekend of racing.